A few days ago a mysterious box of kolaches showed up in our break room. By lunch they were gone and the kolache box, covered in advertisements from third parties, was about to be tossed. But, as an internet marketing company filled with inquisitive geeks, questions had to be asked. Where was the company branding from the kolaches-maker? No branding, no website, no phone number. Where did these QR codes from advertisers lead? As the microwave heated up frozen meal after frozen meal, we scrambled with our smart phones to follow these QR codes, judge the landing pages and philosophize about the right way to integrate aforementioned QR codes into this type of advertising, and where the heck these kolaches had come from. Even after hunting down the kolache buyer, Jeff Powell anonymous, it remained a mystery. “I don’t remember where I got them,” he muttered, intently focusing on his computer screen while mastering the world of social media. “But you bought them this morning!” I cried, exasperated. “Yeah. It said ‘Donuts’.” And with that the kolache company was ne’er to be found. The first lesson here is a long-lived one: for heaven’s sakes, make sure your branding is on everything! But the second lesson delves deeper into the world of QR codes and the proper usage in an advertising capacity. 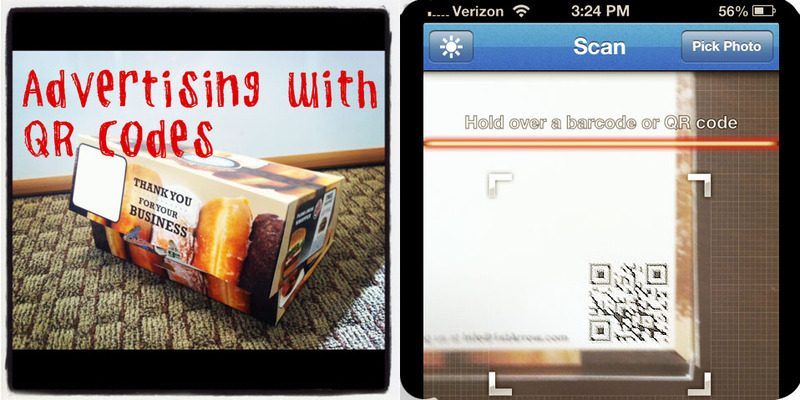 Let’s first take a look at the QR codes on our box of kolaches. However, where this begins to fail is the code’s landing page. It’s nonexistent. Instead it redirects to the home page of the gutter company’s site. There is no trace of the coupon featured on the kolache box, and there is no contact form. You don’t need a developer or designer to create a glorious landing page, even though that is nice. Any business can create a quick and easy landing page integrating the above recommendations. Don’t waste this “initiated relationship” by making information capture difficult or impossible. QR code 2 produced a strange conundrum. 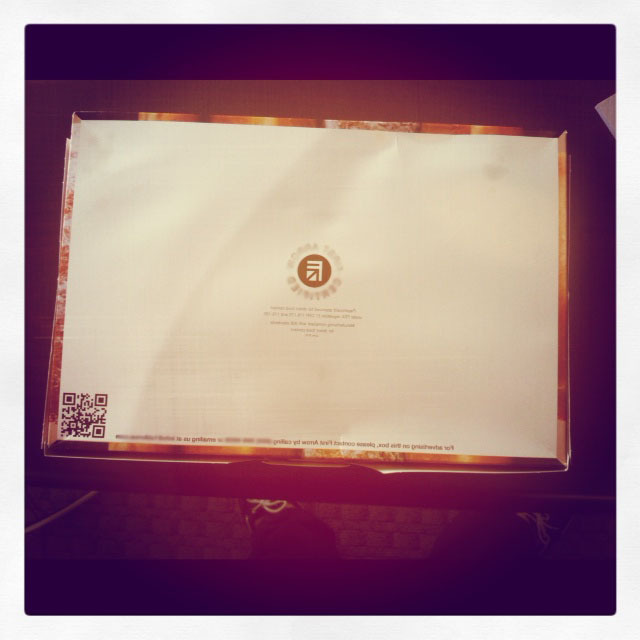 This code, on the bottom of the box, was produced by the box makers themselves, an advertising solutions company. When we first scanned the code during lunch, it lead to a page about advertising on the company’s donut boxes and purchasing those boxes. Regardless we can still learn a few things. Make sure your QR code lives up to the consumer’s expectations. The QR code on the bottom of the kolache box was next to a line of information, but seemed unrelated to the information. There were no descriptors and nothing explaining where the code would lead. It’s a surprise! Maybe a free kolache coupon! Maybe free advertising space! No. Just a page explaining the donut box and the advertising procedures. This would be great if that’s what I were looking for, if that’s what I was prepared to see. But I wasn’t, so I clicked away in spite. Other consumers will too. Be sure the purpose of the QR code is loud and clear. Make sure your landing page works! The broken site was troubling. I had multiple coworkers scan the code to make sure it wasn’t just an issue with my phone or QR scanner. It wasn’t. If a consumer takes the time out of their life to scan a QR code it very better well work or else you’ll have an irritated, vengeful-demon-barber-type on your hands that will never trust your QR codes again. What Has the Kolache Box Taught Us? QR code advertisement is an end-to-end tool. There has to be complete follow through when it comes to planning that type of campaign. A QR code is a brilliant, underutilized tool, so it’s very exciting to see it being used by local companies on a kolache box. With these simple tips, these companies, and companies like them, will find themselves swimming in turnaround from this 21st century advertising tactic. What QR code advertising tactics have worked for you? What haven’t? Is this a good marketing strategy for your company?